Combining shredded chicken with brown mustard, honey, and tabasco creates a flavorful filling for this quesadilla recipe. Adding ripened mango adds a sweet twist! Combine first four ingredients in a small bowl and mix with shredded chicken. Heat a large IMUSA sauté pan on medium heat and spray with some non-stick spray. Add flour tortilla and spray top side with more non-stick spray. 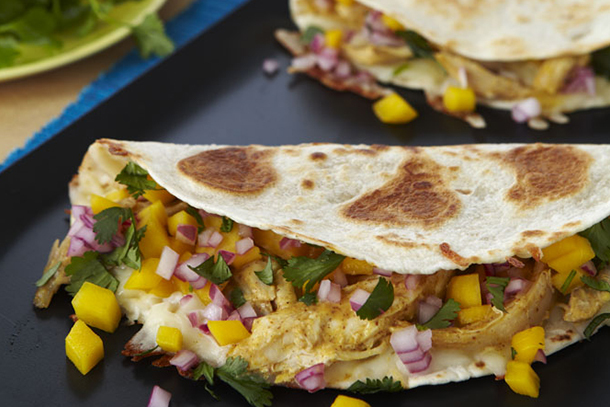 After a minute, flip the tortilla and evenly spread ½ cup of cheese. Then spread on half of the tortilla some chicken mixture, onions, cilantro, and mango. Fold over tortilla, like a book, and allow cheese to melt completely. Cut into 4 wedges and serve with sour cream, if desired.